The 49ers have agreed to trade a fifth-round pick in 2019 for former Detroit Lions guard Laken Tomlinson, according to Ian Rapoport. 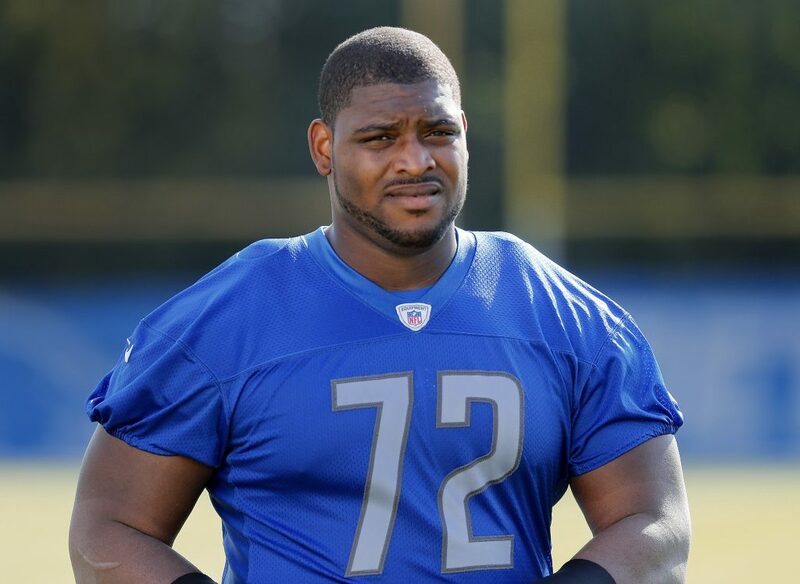 Terms: The #Lions trade guard Laken Tomlinson to the #49ers for a 5th rounder in 2019, sources tell @MikeGarafolo and me. Tomlinson was a first-round pick in 2015. He has started 24 games at left guard during his career, but this year he had been playing right guard for the Lions. With Tomlinson on the 49ers, here’s what their depth chart may be on the offensive line. I’m surprised by the trade for a couple different reasons. (1) From what his scouting reports suggest coming out of college, this is a “phone booth run blocker” that lacks the agility to hit moving defenders at the 2nd level. He has limited lateral agility. Best suited for a power run blocking scheme. How can we expect him to excel in a scheme that features so many outside zone runs? (2) The compensation bugs me. A 5th round pick is a little steep for a player that was likely not even going to make the Lions roster. He graded as one of the worst guards in the NFL last year. Seems like a 6th or 7th round pick would’ve been much more appropriate. He is the Lion’s version of Chilo Rachal. They’re excited to finally get him off their roster. This move screams desperation to me, and I wouldn’t be surprised if we find out that Garnett will be going on IR soon. Kinda makes you wonder why a passing team like Detroit would have drafted a “phone booth run blocker.” Perhaps the Detroit scouting report had something different on Tomlinson. Or maybe their GM went to the Trent Baalke School for Drafting Injured Players and Scheme Mismatches. Trading for a 1st round pick who lost his starting job a few games into the season last year isn’t too exciting, but I guess the 9ers are only give up a 5th round pick so it’s a cheap price for an o-lineman with a lot of experience. Tomlinson struggled at LG with Detroit and became expendable. In college Tomlinson played RG and excelled. Any thought that he might be slated for RG with the 49ers? Plus the pick is for 2019. Maybe they’ve seen film of him blocking outside zone and think he gives them something to work with and improve upon, like maybe better conditioning and losing 10 lbs. Yes, not too exciting, but they think it might make them better, so good. The trade says the 49ers are (appropriately) desperate for interior O-line help. Perhaps Garnett’s knee is worse than thought. Or Trent Brown’s “undisclosed” injury might be serious. – The new player is a cap casualty (like Boldin) and was traded below market to the 49ers. But this smells of desperation. My guess is either Adam Peters, John Benton or both, liked this kid coming out of College and pushed taking a flyer on him. The compensation is minimal but it’s a little surprising considering Magnusson had been playing pretty well and looked like a good bet to make the final 53. I wonder if this means Garnett will be gone longer than initially expected? Rocket – That or then-Lions general manager Martin Mayhew, now with the 49ers, took him in the first round of his last draft. Ding Ding Ding. The Mayhew connection is interesting. What it means . . . ? Great point Mike, I forgot about Mayhew. I initially did as well, but he obviously did a ton of work on this kid. Who knows, we were all so excited to get a new starting pro bowl Center from Baltimore. Very true. Hopefully this works out better than that did. Or perhaps Meyhew is doing a Trent Baalke and is setting up a situation to prove that the guy he tauted as a first round pick wasn’t as big a mistake as he seems to be. Sort of sticking with a guy longer ( but with a different team ) to prove yourself right. Seems like Garnett will start the season on IR with a designation to return. At one point it looked like he was out for a month and potentially back by season start or week 2. I assume that has totally changed? That’s 8. When Garnett moves to IR DTR, then the 49ers promote whoever the best remaining OT/OG who has cleared waivers is? If they carry 9 on the original 53, who are they going to cut and risk losing? So, I don’t see a way around putting 9 OL on the original 53, with Garnett moving to IR – DTR. But Devey is He Man and the master of LG? They should just shelf Garnet for the season since they are using this season to evaluate players anyway. Gives them one more slot. Naw, just an arthroscopic clean out. You need him to keep developing. I dunno’…you seem to be the one with the comic books…. I don’t recall Devey ever being hurt. Remember, he’s Mormon and took two years off to perform his mission…. He’s smart enough to pick up the complexity of the offense, but I have my doubts he’s athletically a fit. He’s more of a phone booth blocker with poor footwork. I like this trade much better than the idea of Cameron Irving, but that’s not saying much. Another 5th round pick, and it seems that Lynch feels the same way that Belichick does about them. He doesn’t like ’em…. He’s fast enough to run numbers to numbers with a 1.75 10-yard split in the 40-yard dash. Thanks for that info. Encouraging. And Garnett’s 10 at the Combine was 1.84. He might be trade bait too down the line. They must feel he’s got the athleticism to play in this scheme or they wouldn’t have traded for him. For a 5th round pick 2 years from now, it’s a decent gamble for depth if nothing else. And how many times have you watched Detroit Lion games and specifically Tomlinson since 2015? RRRRiiiiiiiighhhttttttt… Some people just see everything…. They could have waited for Schofield to get cut. They went with a former 1st round pick with more upside (higher ceiling). Imagine that. With that said, I hate losing a draft pick. But that’s probably all the Lions would take. I agree with the other commenters that Garnett could be out longer than anticipated. That has nothing to do with our conversation. I assume you are trying to move the goalpost. In back to back days, a young underachieving 1st round pick was traded for instead of waiting for a below average mid round talent like Schofield. Just admit that you may have been wrong for once. And BTW. Shanny and Andy Reid > #80 and Razor. First thing they teach you in Marine Corps Boot Camp, never assume anything. I posted it to ease your your concern over 5th round draft picks. Smh…. I am guessing Garnett will be out for a while, and they will put LT in at LG, his natural position. Beadles is a good backup, because he is versatile, but he had a poor ranking last season. LT is a definite upgrade, and it only cost a 5th. Sure, it sounds desperate, but it also signals to me that John Lynch is desperate to win. Maybe LT will thrive in a new system. Guess I am clutching at straws, but I will defer to the scouts and Peters. Left guard isn’t his natural position. Right guard is. He played RG all throughout college and when moved from LG to RG with the Lions he showed more promise than he did his first couple years in the pros. So noted. Just saw him starting at LG for the lions. What does desperation have to do with it? It’s about acquiring depth. Everything is so dramatic with you. Lay off the estrogen supplements Sebnnoying! I see a haunting storm coming! So, What, the 49ers parted with a 5th rounder for solid depth. Smart move, by a smart front office. Martin Mayhew is the 49ers senior personnel executive and was the Lions general manager when Detroit drafted Tomlinson 28th overall two years ago. Grant maybe you can find out what is up with Garnett. Not much info on him since he got hurt. Maiocco- Kyle Shanahan did this in 2015, too. Falcons acquired Andy Levitre in a trade 10 days before season opener. He started Week 1 at left guard. I would guess what many have already stated that Garnett is not as well as first thought. Even so it was a bit puzzling given Magnumson’s play along the line. My guess is they are looking at depth at guard and perhaps tackle. Price seems a bit steep. It is not steep because it is a 2019 pick. Playing with borrowed money. I’ll post one last thing about Tomlinson. Apparently he hasn’t given up a sack up the middle in two years….Many may recall the Denver game when the defensive linemen floodgates opened non-stop up the middle. This is no surprise. We talked about how Bill Walsh put an add in the SF Chronicle for neighborhood tryouts for the 49ers back in 1979. Walsh, a new hire, knew the 49ers were coming off a 2-14 record in 1978. Guess what, Shanahan/Lynch know the 49ers are coming off a 2-14 record and are just getting a jump on that free for all on Saturday……2-14 !……Jobs are at stake , the Niners will be active ! Some say Niners game 3 starters were in under fronts much of the time. For all with screen capture acumen, anyone want to be a hero and post images of fronts with player/position labels? Saleh is uses a 4-3 under front, brought from Jacksonville. He also uses Seattles base defense which is a 4-3 under and where Saleh got his start. It will be somewhat chaotic around the league on cut down day and for a few days afterwards. Absolutely! The next 120 hours…ample opportunity for high-fives, blood curdling screams, head scratching, dropped jaws, and finger pointing. Will quick hips be on the docket ? and 15 deg. QB head fakes (or was it head games via Foreigner)? Did some checking ,. He has played in a zone running game ,been a bit ,( note # took over job from Manny Ramirez , ) So can’t be but so bad ,was nicked up last year ,his weight seems to be down from adjusting to zone inside running game ( similar to V Mc ) so let’s see if he can play outside zone running game. Needs to get in running shape , but at least we aren’t going to have a guy get hit and land on his back side . Like the idea of it being harder for a team to come up the middle , and hit our QB . He is alot more stout at the point of attack . Definitely an upgrade . Pick was a little high . But he was a first round pick. Guess we will see tonight . It seems like a 5th in ’19 = a 6th in 18. Not that bad. Plus, if you wait for cuts you could lose at musical chairs and not find the help you hoped for. I think the biggest plus is his smarts. That should help him pick up the system quick. My thoughts as well. They needed someone capable of grasping the complexity of the offense on the fly, regardless of his marginal athletic attributes…. Wonder if he will be in uniform…less than 8 hours to kickoff. #49ers traded a 2019 5th rounder for Laken Tomlinson. He’s a former 1st round pick & knows the zone blocking scheme. Tried to post Tomlinson destroying a blitzing Seattle DB. Just google: Niner nabs + enter. It’s approximately the 8th post down. Tomlinson looked like an angry Hippo destroying a wiley croccodile sneaking inside the compound. * ie, destroys a Seattle LB. He can be expected to be in the #49ers starting lineup in Week 1. Matt, are u implying that this front office/coaches are spotting deficiencies & are actually trying to fix them? The Manster, but not Kapster ? Kyle Shanahan did this in 2015, too. Falcons acquired Andy Levitre in a trade 10 days before season opener. He started Week 1 at left guard. Garnett will have to be part of the original 53 before being able to IR him with the designation to return status, if I’m not mistaken. probably because of josh garnett’s injury. Hard to get too excited by a guy that’s been a dud to this point. But who knows, maybe a change of scenery. Hopefully works out better than Devey. And as good as Kerley. Scooter and Razor….unless the two of you have become followers of Seb….what do you have against Jordan Devey ? He got traded away from a 2-14 team (49ers) to a playoff team (Chiefs) and as of 5 minutes ago, was the #2 LG on that team….He’s nott the first mistake we’ve traded away in the last 4 years…. When the Devey breaks, you’re going down. I have nothing against Devey. But he did not work out for the 49ers. Or do you disagree? Devey sucked on the Pats and then was less than competent for SF. He has a job now? Good, I don’t miss him. Looney has a job with Dallas, don’t miss him either. We need better is my take. Ha! I sure as hell don’t miss him! Both Scooter and Razor are very astute. Devey is a QB killer, and acted like a turnstile. LMJ was not blackballed. They even gave him the ball on that last drive in the SB. If he was blackballed, he never would have gotten a chance with the Dolphins. He was a bust there, too. Your Oregon homerism is clouding your judgement. Just came across this Tomlinson breakdown from Inside The Pylon. I’d love it if their analysis turned out to be the case. Some impressive pass blocking. Apologies if someone posted this above.